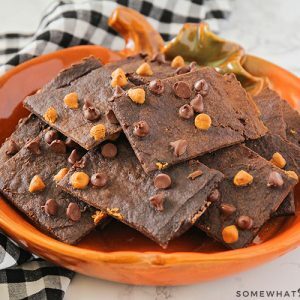 A rich chocolate flavor with a crisp cookie crunch - this brownie brittle recipe will satisfy your sweet tooth in no time at all! Combine the brownie mix, pumpkin puree and pumpkin spice. Cover two 12x17 pans with parchment paper (I use my rimmed cookie sheets). Using half the batter for each pan, spread the batter with an offset spatula into a thin layer. Sprinkle with chocolate and butterscotch chips. Bake for 20-35 minutes. This is a wide time range because there are so many factors that will affect when your brittle is done (like actual oven temperature, batter thickness, etc). Start checking it at 20 minutes. Using a pizza cutter, score the brittle as soon as it comes out of the oven (or don't score it and just break it into chunks after it's cooled). Let cool, then break apart along the scored lines. I sprinkle the chocolate & butterscotch chips on after I spread the batter because it's much easier to spread without lumps all over the pan. I learned from experience, so just trust me. I use parchment paper instead of my silicone mats for two reasons: 1) it's easier to grab the edges of the paper to lift the brittle off the pan, 2) I can score the brittle on the parchment paper and not worry about cutting my silicone mat. If you store your brittle in an air-tight container, it will go soft. No one wants soft brittle, because then it wouldn't be brittle!